Last week, financially speaking, was a real “Turkey” for the world with little intestinal fortitude to be thankful for in our leaders. The Gang of Twelve congressional legislators charged with finding a bipartisan solution to cutting the deficit whilst finding new revenues bugged out on their responsibilities even before the deadline came, Monday, 21 November. It took no Nostradamus to predict this outcome. The committee gathered together after the tragically laughable sand box kiddie clash in US Congress back in July over raising the US debt ceiling, letting the Romper Room standoff go all the way to the drop dead timeline of 1 August before the US defaulted on its debt payments. It sent worldwide confidence in American leadership and the stock markets to the worst lows since 2008 and America lost its premier credit borrowing rating. Standard and Poor’s lowered the investment rate of the United States from triple A to double A. The first time in history that has ever happened to the largest economy in the world. Back in August, S&P’s threatened to lower the US credit rating further in December if the six Democrat and six Republican legislators comprising the super committee created by the Budget Control Act did not come up with a long term financial plan. In effect, a so-called “trigger mechanism” will initialize an automatic $1.2 trillion set of spending cuts deep into entitlement programs, Medicare and especially the Pentagon’s military industrial complex budget over ten years. No holiday for Europe last week, but thank goodness the Americans could stuff their faces and slump back into comfy chairs on Thursday in a triptafen flatulent turkey “meating” of sleepiness, watching with heavy lidded eye the NFL and college football games, the Cable TV marathons such as the Military Channel’s “Tanks”-giving. The next day, Black Friday, was the official Christmas holiday shopping season where retailers hope they’ll be “in the black” making profits as the consumers “Santa” their “closets” with sequestered presents for unwrapping under a slaughtered tree on 26 December. Christmas shopping can be a Christmas Tale, a retail-ing of good cheer that can account for 40 percent of all profits made per year. 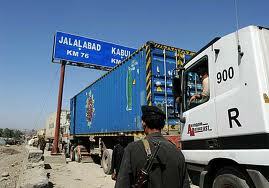 NATO convoys on happier days when Pakistani customs let them rumble over the border into Afghanistan. Friday through Saturday, Americans were shopping and by Saturday evening getting tripped out dozy on leftover turkey, pleasantly unaware for the most part that US-Pakistan relations that day had fallen to an all time low after NATO drones blasted a few dozen Pakistani border guards mistaken for Taliban fighters. Islamabad closed the Hindu Kush road, a key lifeline for US and NATO supply convoys rumbling into land-locked Afghanistan. What with Kirgizstan’s new president ready to let the US lease run out on an airbase key to supplying US forces in Afghanistan, I imagine American forces occupying Afghanistan could come home far sooner than 2014, as my oracle predicted. Most of them by the end of 2012, even. Turkey Rapture! It happens every November in America. Well, that is all the time I can spare today on writing blogs. I have to get back to Predictions for 2012. I am on a writing blitzkrieg since 16 November when principle writing unleashed an avalanche of words pouring into my Mac mini an average of 3,500 to 4,500 words a day! It appears like I am giving labor to what will pop out as a very large boned literary baby. The bad news is, I’m not sure it will be finished and ready to send it as early as I wanted to in December, initially to all those who have advanced its cost of $12.50 or more as a donation to HogueProphecy. All of you who have and continue to generously donate the cost of an advance copy will get your book well in advance of the worldwide publication date of the e-book. The good news is my prophecies for 2012 are going to be the richest of all my annual almanac entries in content and the number predictions, so a think the little longer wait will be more than worth it. My oracle has A LOT to share about the events of 2012. Some amazing stuff has come like lightning through these fluttering fingers over the keypad. I am averaging bringing into the world in first draft a chapter a day. Because 2012 is so significant in Mayan astronomical and astrological reckoning the subplot of it will be rich in the astrological examinations so many of my readers enjoy. Not only are there forecasts using Western Astrological traditions but Chinese too as we “enter the Dragon”, Bruce Lee style so to speak with yesterday’s chapter entry, The Year of the Water Dragon blowing Economic Bubbles. The day before that I brought into the world the oracle’s redefinition of a new clash of civilizations forthcoming on the global economic front called Dominion versus Democracy. I don’t eat turkey or make a big deal about Thanksgiving Day 2011, because this November holiday reminds me more about 9 November’s Kristallnacht than a date to celebrate being thankful, because it marks an important milestone in the Native American Holocaust as those of you who have read my controversial articles already know (click on Thanksgiving Day). No Turkey, not even Tofurkey for me. I was writing on that holiday. I think I finished the oracle’s report on the US presidential elections in 2012, entitled: Primates in Primaries for President. The chapters are coming through my fingers out of sequence. My memory of what came through and when is now a blur that only my next edit run-through, which must begin as soon as I post this, begins with a ruthlessly compassionate editorial cut and pasting – sometimes plastering – what is written into shape. Therefore, that is it for fresh words for today’s weekly blog until my forecasts for 2012 are entered, edited and completed, hopefully soon. What follows is the publication of an interview I did with the Raw Epicurean back in March 2011. 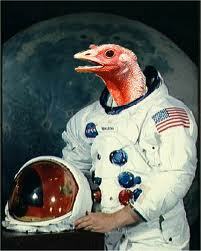 Prophecy is like turkey-time leftovers. If they are cooked well they get better with age. So, with this being posted at the end of another Thanksgiving 2011 holiday weekend, let America’s biggest holiday celebration of gluttony and heartburn, launch a further look into frankenfoods and the future of food. "Beam me up, Scotty! 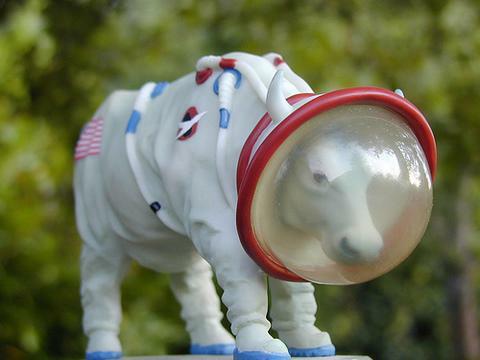 Let's Mooooo--ve my meat into that Golden Future!" INGRID (Weithers-Barati): Worldwide there’s great concern over genetically engineered crops [corn, soybean, sugar beet, cotton, and most recently alfalfa, to name a few], and its effect on our food supply. What is the point? Is this all about profits? Politics? Control? What indeed is the point? Understanding the human mind that asks such questions. Understanding first how this human mind imposed on us is conditioned to see things in a narrow pigeonhole of self-interest. For instance, the question asked. It is colored and supported by a certain narrow interest in food purity. That sentiment is noble, but it stands on the idea that food seems only now to be dramatically re-engineered away from its purity by technology. Is that indeed the case? If it was not for ancient Dr. Frankensteins who genetically altered wild corn -- Teosinte ( left) -- into the big-kerneled pop-corn bangin' modern kind, we could not have sustained our modern civilization this far. Genetic engineering of food is at least 5,000 years old — as old as human agriculture itself. 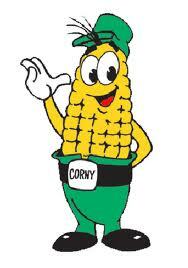 If you are truly a food purist, stop eating any form of corn because this fundamental foodstuff of the world is one of the earliest Frankenfoods. 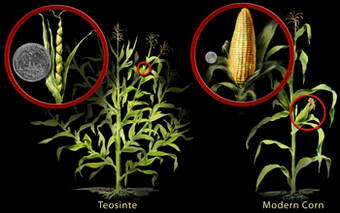 Millennia ago, corn was similar to a grass stalk. People began mutating it through low-tech genetic engineering until it became its giant, monstrously kernel rich form we take for granted as “pure” food today. What big agricultural business is doing to explore and alter food genetically is nothing new. Most of our pure foods like wheat and rice are mutant food. Pure “bread” is “bred” mutations over centuries, thank goodness! Otherwise, a true purist would have to run naked in the wilds and return to the gathering of sparsely nourishing grains of the wilds like Neolithic peoples. I suggest that is a wrong concern. It is a weed of a concern ignoring the weed’s root problem. If you tear up the weeds without exposing and pulling out the root problem, you only make more weeds. The root concern underneath all motivations of ancient to modern genetic engineering is how to feed an ever-growing population. The Green Revolution is taking a radical turn to more daring genetic engineering in our times not solely to make money for agri-businessmen, but to sustain supply to a catastrophically growing demand. One can and should be concerned about the new and radically risky ways agri-business scientists are altering our food because some of these could result in apocalyptic consequences — global famines foreseen by many prophets down through history that have a contemporary sheen (as we will see below). However, be aware that the genetically engineered “medicine”, though it is dangerous, is not the “sickness”. The sickness is human unconsciousness that goes on demanding like a mindless bark beetle more than the agriculture can sustain, while we “un-think”, like rats that humans can go on breeding more and more people the human range cannot sustain. One can forgive the bark beetle or the rat for just being an animal, following its instinct to eat and breed as much as it can, because the job of balancing its numbers is beyond its pea-sized mind’s understanding. 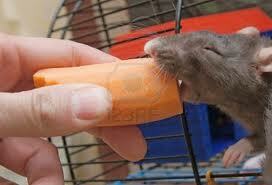 Nature comes and culls the rats with disease and famine to restore balance to its numbers. I can forgive the animal, but I cannot forgive the human being, blessed with potential sentience, blessed with a huge brain that can “see” and “think” and reason beyond instinct what needs to be done to restore balance to the world. Forgive me for repeating my rat-to-human analogy. Compassion compels me to, because most of you who are reading this are not absorbing this reality beyond an intellectual titillation. Most of you will read this and think about it, because it entertains you to do so. Then you will blink and go back to consuming, breeding and feasting like rats. In the next 20 years, many of you reading this today will starve and be extinguished like mindless rats when you could have lived like men and women of consciousness. You could have rediscovered the blessing of consciousness potential, found a way to lower your population and sustain food production until the population explosion begins to naturally flame out after the mid-21st century. I have to lay out this painful potential of a ratty future before every person reading this. Not to be proven right, mind you, but to galvanize urgency in each of you to change that destiny from happening to you and your children. Do I go on living like a rat and dying like a rat? Or, do I discover and access the intelligent resource of this wonderful brain to live and flourish like a human being who thinks, reasons, is aware of the balances of nature, and thus not live as just an instinctive pawn of nature? Back to your question. Let us focus on its ending this time as we read through it: Worldwide there’s great concern over genetically engineered crops [corn, soybean, sugar beet, cotton, and most recently alfalfa, to name a few], and [genetic engineering‘s] effect on our food supply. What is the point? Is this all about profits? Politics? Control? Allow me to help you consider a new angle on the PPPC’s: the point, the profits, the politics and the control of food sustainability. Let's get "rat" to the point. The point is far more than mere corporate greed for more riches. Economic survival motivates dangerous genetic engineering of food products. For instance, what would happen if the demands for higher caloric sustenance of emergent middle classes, added to the many more new mouths of the poor to feed continues to produce a shortfall of supply? Supply is not being met now. That is why food prices are climbing to their highest levels in human history and are expected to jump even higher in the next six to eight months. Thus it is that we put more pressure on agri-businesses to genetically engineer some “wonder-food” producing grains and vegetables increasing volumes of supply, lowering prices. If prices do not lower, this hyperinflation of the global food market will see it collapse. The agri-business could go out of business with catastrophic consequences to civilization; in other words, no more profits, a collapse of political order and control of the streets. So, it is about profits — bringing the price of food down by increasing yields because though agri-businesses may be making some of the highest profits in their history in 2011, these prices are destroying their market’s ability to pay for the product. 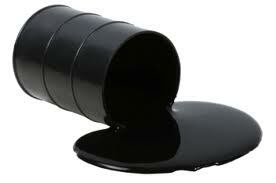 Keeping prices high is like shooting a hole through your lifeboat stacked with money in a storm. It is about politics — if the agri-business cannot find a way to meet demand and prices climb to a point where civil society cannot afford to eat, you get revolutions, like those erupting in Tunisia, Egypt, Bahrain and Yemen. You get a bloodbath of civil war in Libya, which can no longer pay for food shipments until the fighting is over. If the fighting goes on for months, it feeds a higher price. A higher price feeds famine. Famine feeds more civil wars and so on it goes unto agri-business bankruptcy! It is about control — or better, law and order. Without affordable food coming from a bountiful increased supply, there will be revolutions and upheavals. However, do not take that to mean I am in support of those control freaks that dictate from the palaces of Arab nations, or those agri-business corporate dictators that try to control growing by exporting one-yield-only seeds. 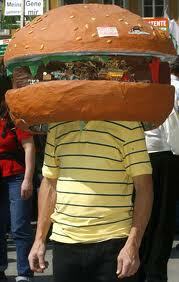 Dictators of a political or an agricultural cloth are an impediment to human food sustainability. However, the democratic movements in the Middle East and North Africa are going to find a world after their dictators have fallen that still cannot feed and sustain itself, as the system exists now. I am not saying you should not grow your own food. This is necessary. It is one of the steps in the solution. Keep moving to the other steps. The world needs a globally supported food price standard set that can equally sustain agricultural industries and political stability. You must lobby your leaders for a Global Food Summit while you sew crops in your community gardens too. *UPDATE from today: I am happy to see this prediction’s timing is wrong. Global oil is entertaining a jump above the $100 a barrel mark last week. Gas pricing is still high in America, approaching $4 a gallon, but I am off a buck for autumn 2012. May my predictions about gasoline prices remain too high. Still, expect $5 gas at the pumps in 2012. The $7 a gallon “petrol-geddon” price may come after 2012, or not at all, I hope. This entry was posted in Food's Future and tagged 2012, Afghanistan, Barack Obama, Budget Control Act, Christmas Shopping, forecasts for 2012, frankenfoods, gas prices, GOP, Green Revolution, Hogue, Italy defaulting, John Hogue, NATO, oil per barrel, oil prices, Pakistan, petrol-geddon, prediction, predictions, predictions for 2011, predictions for 2012, prophecies for 2012, Raw Epicurean, Romper Room, Standard and Poor's, Thanksgiving, tofurkey, tripafen, US Debt Ceiling, US-Pakistan relations. Bookmark the permalink. Post a comment or leave a trackback: Trackback URL. I will be glad to read your Predictions for 2012. Here down south, the loud religious folk are coming out of the woodwork preaching these days, and its getting so tiring batting all these invaders of my space away. To read something sane and intelligent will be like a tall glass of sweet iced tea to my parched brain. Hi Kira. Sounds like you are having your Obi Wan moment waiting for Luke to mature in backwater Tatooine. Its “southern hemisphere” of course. Today I was working on the feminine zeitgeist issues inherent in Neptune’s homecoming in Pisces for 2012. The tone of this book is VERY different from the last almanacs. More watery-mystical, like the coming year. (Well, that’s part of the year. One must not overlook the fiery Aries Uranus square earthy Pluto coming.) This book has my most astrologically influenced narrative for any of my almanac books. I must go back to the work. I have an insane amount of work before me in an insanely short deadline of the next few weeks to get it done. It will happen. Hi John. If I lived nearby I would come over and cook or hold papers for you so you could work nonstop. Instead I suppose I will just send you some support vibes. 🙂 Such synchronicity that you mentioned Obi Wan … I have been reading Star Wars stories to my son lately. Its all we talk about! I was thinking about the heavy Neptune influence the other day, and remembered when I was doing my analysis a faint voice echoing “assassination”. Not sure if I wrote that in or not, but its just something I remembered. Of course, Neptune is all over the globe. So “assassination” could effect any or all countries. I suppose each individual’s charts would have to be checked. Thing disappearing, and the invisible appearing. Just fascinating to ruminate about. I am learning to trust my intuition more and have found it is super fun to explore. I’ve also been studying the Mayan culture a lot lately, and trying to relate it to… well to anything, actually. It was such a bizarre culture, I am having a hard time imagining being there. They were so brilliant, and so incredibly violent. What star formations would “create” a culture like that?? Just a few thoughts to give you a break. Best of luck and speed to you in your final lap! is in a huge bubble as well as oil and other commodities. He’s also been predicting the Dollar is headed WAY up due to a future radical reduction in US dollar currency volume…(haircut?).. spot on in predicting the dollar’s rise. Most others have been commanding that it’s headed south in a big way!